​An AAP policy statement describing the 2017 recommended immunization schedules for children and adolescents will be published in the March 2017 issue of Pediatrics (published online Feb. 6). The updated schedules include a few revisions from 2016, including the availability of a two-dose immunization for human papillomavirus (HPV) for children who begin the series before their 15th birthday. The schedule continues to recommend that teens age 15 and older receive three doses of the HPV vaccine. The 2017 schedule has eliminated a reference to the live attenuated influenza vaccine (the nasal spray vaccine), after studies showed poor effectiveness for the last 3 influenza seasons. The schedule includes a new column for 16-year-olds to emphasize the need for a meningococcal conjugate vaccine (MenACWY) booster dose at this age. Also new is a table that addresses which vaccines may be indicated for children from birth through 18 who have a specific medical condition. 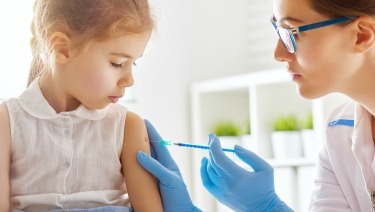 The immunization schedule is revised annually to reflect current recommendations for use of vaccines licensed by the U.S. Food and Drug Administration. The 2017 schedule has been approved by the American Academy of Pediatrics (AAP); the Advisory Committee on Immunization Practices of the Centers for Disease Control and Prevention; the American Academy of Family Physicians; and the American College of Obstetricians and Gynecologists.